Sangita Pudasainee-Kapri knew at a young age that she wanted to pursue a caregiving profession. She developed an interest in medicine while growing up in the Tariphat village in the Gorkha district in rural Nepal, where the only health care available was a health post, a small office staffed with a couple of medical professionals who could only provide basic care. Anyone who needed services for serious issues would need to travel to a hospital located in Kathmandu, if they could afford to make the approximately 12-hour trip requiring a six-hour walk, then a six-hour bus ride. 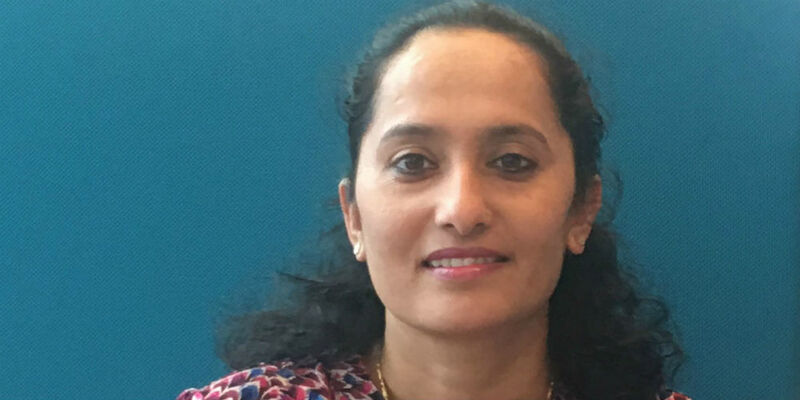 In her 18 years in nursing, beginning when she was in Nepal, to her nearly 11 years in graduate school and working at hospitals in the United States, Pudasainee-Kapri’s interest has been in pediatric nursing. In addition to treating children, a significant part of her job is conversing with her patients and their families—explaining medical terms, medical conditions, and pharmacological and non-pharmacological management for best patient outcomes. “When I’m able to explain to families more clearly what’s going to be happening, and helping them to feel more comfortable, it’s rewarding,” says Pudasainee-Kapri, a first-year student in the doctor of nursing practice (DNP) program at Rutgers University–Camden. A recipient of the prestigious Johnson and Johnson American Association of Colleges of Nursing Minority Nurse Faculty Scholarship, Pudasainee-Kapri received $18,000 to further her research and education at the Rutgers School of Nursing–Camden. Currently a nurse at Jefferson Washington Township Hospital, she brings her wealth of experience in Nepal and hospitals in Minnesota, New York, and New Jersey to care for her patients, who are of many races and ethnicities. She spends time with her patients and their families to build a rapport. In developing a relationship with them, there are times in the course of a conversation when she learns that the patient is taking other medications—over-the-counter or herbal therapies that might interact negatively with a prescribed medication. After receiving her undergraduate degree in nursing from Tribhuvan University in Nepal, Pudasainee-Kapri worked as a nurse, and in 2008, she moved to Illinois, where her husband was in graduate school. Later, they moved to Syracuse, N.Y., where she earned master of science and doctoral degrees in child and family studies at Syracuse University. She has conducted research on health and developmental outcomes among at-risk children and families. Her 2015 paper, “Associations Among Supportive Co-parenting, Father Engagement, and Attachment: The Role of Race/Ethnicity,” was published in the Journal of Child and Family Studies. The Rutgers–Camden doctoral student currently is working on several papers including exploring the link between moderate-low birth weight and cognitive competence in children, and the impact of sleep and emotion regulation on the mental health outcomes of children. After Pudasainee-Kapri receives her DNP degree from the Rutgers School of Nursing‒Camden in 2020, she hopes to teach pediatric nursing, nursing research, global health, and health policy at a university.